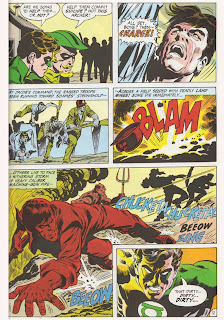 One of the most highly regarded books of The Bronze Age was Denny O'Neil & Neal Adams' celebrated run on Green Lantern / Green Arrow, the so-called 'relevancy' series. 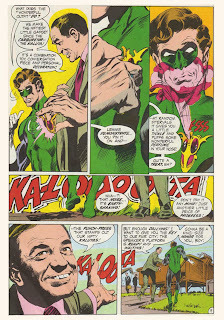 Green Lantern was a comic, and a character, long in the doldrums when publisher Carmine Infantino decided to give it one last shot in 1970. 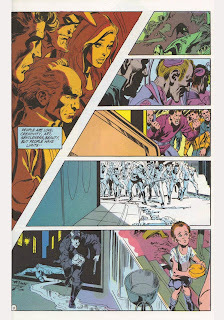 The team of O'Neil & Adams had already performed similar surgery on Batman, dumping the long, sad era of camp that infected The Caped Crusader and bringing him back to his Dark Knight roots. 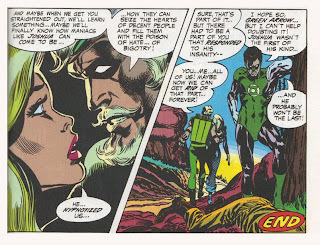 Maybe Green Lantern could be similarly rejuvenated. 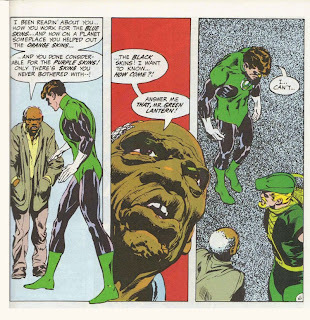 Immediately, GL is defined as a 'good cop', the well-meaning but naive foot-soldier who jumps into every conflict, absolutely convinced of the right of his cause. 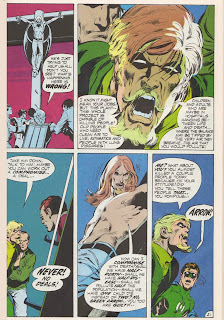 Green Arrow, by comparison, is recast as the forthright liberal, hectoring his less 'aware' partner into seeing the actual reality of each situation. 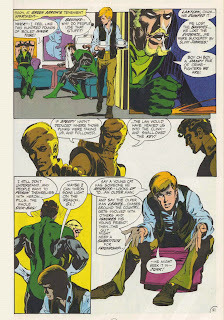 This would be the dynamic of the strip from then on, as O'Neil & Adams put the heroes through a series of adventures illustrating society's ills, with each story tackling a different issue. 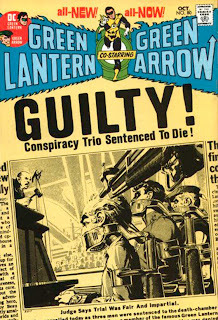 By the end of the first story, the slumlord is on his way to jail, but, in an epilogue setting out the real theme of the tale, Green Lantern's unquestioning loyalty to his bosses, The Guardians, is taken to task in no uncertain fashion by Green Arrow, leading to the series' premise. Yep. It's Easy Rider for superheroes. In Ish 77 GL , GA & The Old Timer come across a mining town ruled , with an iron hand, by a gang boss & his crew of retired nazi's. Our heroes intervene on behalf of the poverty stricken workers and their protest singing spokesman, causing a minor civil war in the process. O'Neil is clearly talking about America here, and big business' willingness to trample all over the working man's rights, and uses ( as he does throughout the series ) a combination of realism, satire & parable to illustrate his point. Sometimes it's an uncomfortable mix, but he's smart enough to close the story with the miner's really no better off than before. They're still poor, they still have no hope of a decent future, and a couple of superheroes can't do anything to change that. A little sadder, GL & GA move on. Ish 79 is a really odd one, as here the theme is how the American Indian struggles with poverty, poor education & white exploitation. A logging company is trying to trample over the local Indian's rights' to their tribal forests, and GL & GA seriously come down on opposite sides of the argument this time. 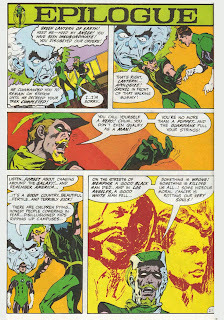 Although they both want to help, their methods couldn't be more diametrically opposed: While Green Lantern searches for a legal solution, Green Arrow masquerades as Ulysses Star, the tribes' ancestral hero, in order to inspire them to revolution. 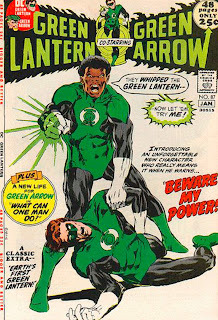 The whole issue leads up to the point where GA's deception is uncovered, and as Lantern finally realises he's had enough of his partner's holier than thou attitude, the mutha of knock down, drag out fights ensues. Unlike every other superhero bust up however, this fight is actually about genuinely opposing views, and like every other fight, ultimately solves nothing. 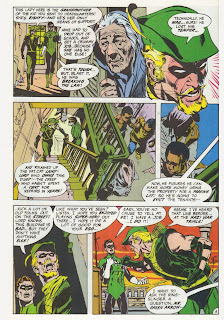 Tellingly, the real heroes of this one are Black Canary & The Old Timer, who quietly get on with helping the tribe in a genuine, practical way. 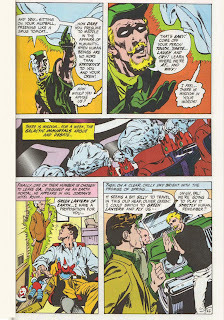 Issue 80 deals with the legal system as, while dealing with a chemical spill ( see, they really are green ) Green Lantern is caught in an explosion, forcing The Old Timer to make the difficult choice of a) stopping the deadly pollution from threatening the generations to come or b) saving his friend's life at the possible expense of the rest of the world. The Guardians, the old spoilsports, are not impressed, and order the gang to the trial world of Gallo, where The Old Timer's fate will be decided. In a legal nightmare worthy of Swift or Carroll however, the smugly complacent judges of Gallo have been overthrown by one of their servants, and soon our heroes are all facing the death penalty. 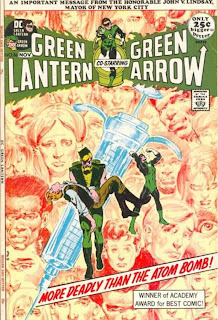 One of the best stories in the series is next, as GL, GA, The Old Timer & Black Canary travel to the hideously over-populated world of Malthus. The horrors of a real population explosion are laid bare in Adams' brilliantly realised art, and as the gang fight against the female scientist responsible for the catastrophe, the final revelation of the villainess' motives is heartbreakingly sincere. 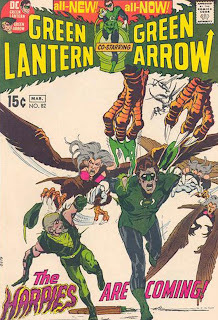 This milestone is followed by easily the weakest story, as Green Arrow & Black Canary are attacked by Harpies, and Green Lantern is trapped inside an alternate dimension populated by man-hating Amazons. 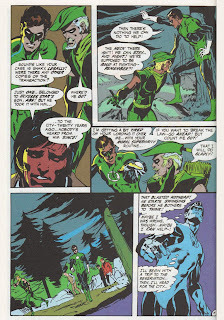 It's all a plot of Sinestro's apparently, but the story really makes no sense, and you can tell O'Neil is merely paying lip service to the feminist issue, as he later admitted in an interview with Jon B. Cooke: " I remember thinking as a good liberal that that was a story that I ought to be writing and I also now know that emotionally I was at least five years away from being able to accept that....Only because I felt that I ought to be espousing it did I do so. I felt that that story just failed all over the place because the writer was just not up to dealing with the material. " We're back in the world of satire for ish 83, as Black Canary is about to take on a teaching job, but strange things are happening at Meadowhill School. A little girl called Sybil is a telepath, and is being forced into brainwashing the other students by the school's cook Grandy. The fact that Sybil looks like Richard Nixon and Grandy is a spit of Vice-President Spiro Agnew lets you into the gag. Alas, I don't know enough about American politics of the '70's to say for sure, but obviously the school, again, represents America in microcosm, and Grandy & Sybil it's unscrupulous, controlling government. 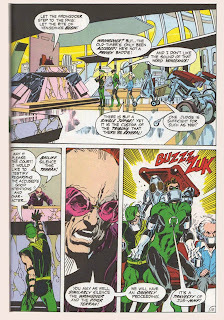 There's also a nice personal touch, where GL's longtime love interest Carol Ferris reappears, forcing him to reappraise his life. A subplot actually more interesting than the main story. 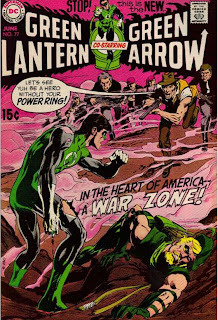 Next up is another story that doesn't quite work, as Green Lantern is trapped in a plastic city of the future by a 2nd division villain called Black Hand. There's a lot of talk about the plastisized, manufactured society, and O'Neil seems to be venting at the willing conformity of the sheep-like masses, but it doesn't really come off. 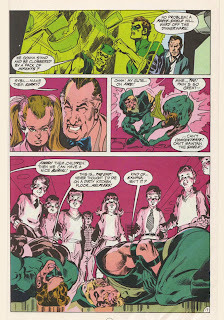 It does, however, have the attraction of Neal Adams being inked by Berni Wrightson, plus there's Neal's in-joke of the weapon that takes down GL being called a 'Kaluta'. The best part of the whole series is next though, a 2 part exploration of the teenage drug problem. 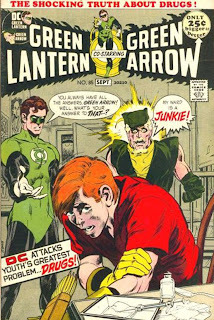 In attempting to bust up a heroin operation, GL & GA come across Green Arrow's sidekick Speedy in a sleazy drug den, and wrongly assume he's working undercover. In fact, Speedy is very much living up to his name, as GA ( eventually ) figures out, though it is, of course, staring him full in the face . 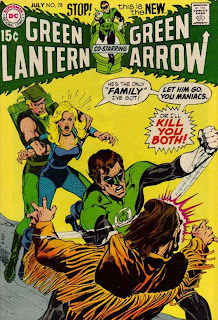 In the concluding part, the guys take out the scum-sucking drug lord in no uncertain terms, while Black Canary again gets on with the real work, seeing Speedy through a night of cold turkey. It ends semi-happily, with Speedy blaming GA, slightly unfairly, for his addiction, and both men coming away a little wiser, and a little less angry. The next issue is a corker too, as the team are split up into two seperate stories. 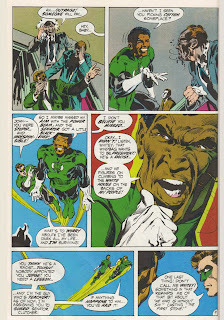 In the first, O'Neil & Adams deal with racism in general, and Green Lantern's racism in particular. 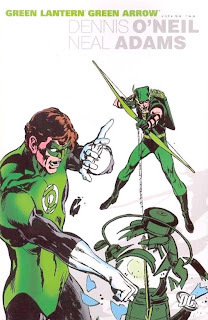 Guy Gardner is hospitalized, so The Guardians order GL to train a new replacement. Our hero doesn't come off too well here, making sweeping assumptions about his new charge that nearly lead to disaster. 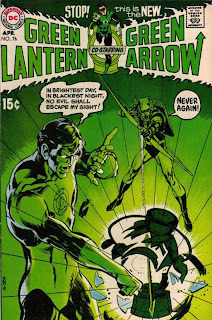 Green Arrow takes centre-stage in the 2nd tale, written by Elliot S. Maggin, as the hot-headed archer experiences a long, dark night of the soul, causing him to make some life-changing decisions. 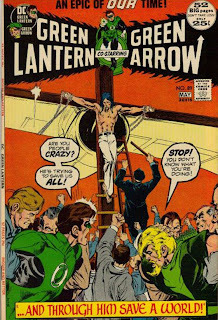 The final tale of the regular series is an extremely odd one, as the guys get involved with a Christ-like enviromental protester called Isaac, who, while trying to stop the excessive pollution from an airport, ends up crucified to a plane. It's all spectacularly heavy handed, but is so far off the wall, you can't help but admire O'Neil for telling a story this insane. 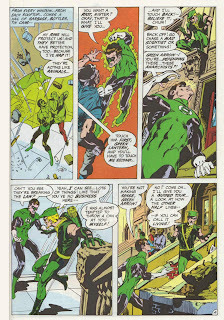 Alas, all this great work failed to save Green Lantern from cancellation, as, although lauded for it's intelligence and uniqueness, sales didn't pick up enough to save the book. There was, however, a coda in the pages of The Flash, which showed where the series might have gone. 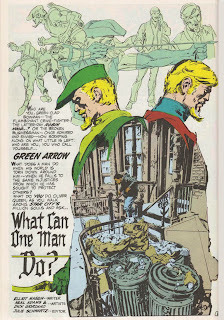 Green Arrow accidentally kills a teenage burglar, and to atone for his crime, gives up being a superhero and goes to live in a monastery ( Hey, it was the '70's ). 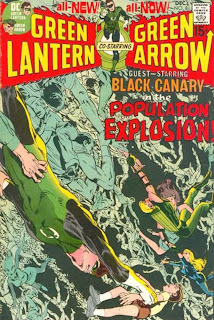 Unfortunately, Black Canary is in need of a blood transfusion from The ex-Emerald Archer, so he has to be found, and quick. 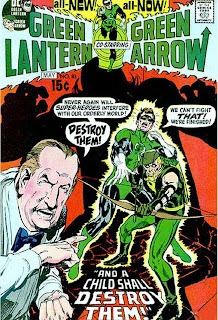 This is a worthy ending to the saga, pushing it into more personal spheres; as O'Neil said, he was running out of issues he genuinely felt passionate enough to write about, and didn't want to do a 'relevancy of the month' comic. 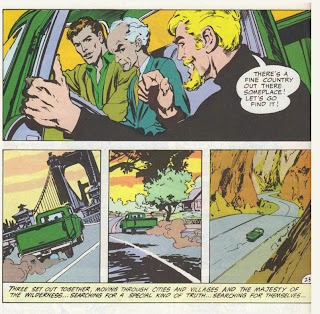 Taken in all, Green Lantern / Green Arrow is a truly great, unique, groundbreaking series, and a pretty indespensible slice of comics' history. For the first time, superhero's lived in what approximated the real world, and, although some of the writing is very much of the time, you have to bear in mind that no one else was even attempting anything like this. 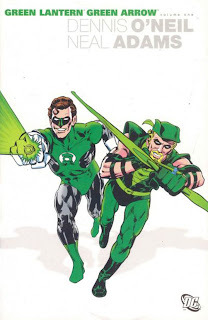 It's also very easy to assume, as a lot of fans have, that Green Arrow represents Denny O'Neil's viewpoint completely, and is his mouth piece, while Green Lantern is the personification of 'The Man'. But I don't agree, the characterization's subtler than that. GL gets in a few lumps too, and GA doesn't know best every time. The artwork is, of course, fantastic, and though it's often been accused of being didactic and preachy, and there's certainly an element of that, the whole thing still works magnificently. As Denny O' Neil said in that interview: " In none of those books did we ever present any solutions to the problems....We were always careful to deliver a solid super-hero story. " The whole thing is available in these two trades, and comes highly recommended. 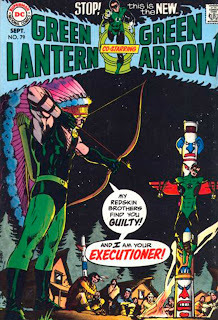 Just like Manhunter, just like Swamp Thing, Green Lantern / Green Arrow more than lives up it's rep.
Quite a good analysis. 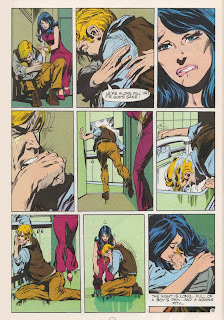 The art, of course, remains spectacular but the stories themselves were so damn relevant to their time that, like ALL IN THE FAMILY and certain other 70's sitcoms, I just can't watch (or in this case read) 'em anymore. 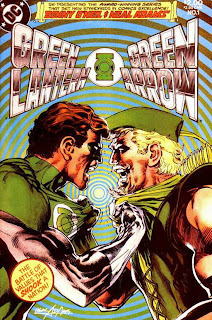 I know what you mean , Steve, but I kind of like GL/GA BECAUSE it's a slightly odd read. Also there is the point that everything is new to somebody: A friend of mine has never read this, Manhunter OR Swamp Thing. Geez, some people, ay? Here's an interesting link that ties to this: http://1.bp.blogspot.com/_GffQlBTa-y8/SdRpdPOmnDI/AAAAAAAAGYY/2YsnD-ZkfPk/s1600-h/AdamsNealGLGATPBcvr.jpg It's the original art to the 1st 1972 paperback collection's back cover. As a middle aged guy old enough to have read these at a young age, I truly enjoyed your analysis. 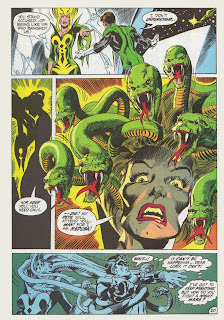 The very first story #76 was of course pretty explosive when it hit the newstands in its day. If you were a reader at that time, it was like nothing you had seen before. But in retrospect, it now comes off to me as a rather procedural set-up for the rest of the series. I especially liked #78, 79, and 80. I wasn't especially impressed by "The Population Explosion" #81. Good, but not one of my favorites of the series. I actually thought both #83 and 84 ("A Child Shall Destroy Them" and "Peril in Plastic") were quite good. I honestly think the drug two-parter is a bit overrated. Mind you, it had some very effective scenes. The part of the story about bringing the druglord to justice always seemed to me to be overplotted. 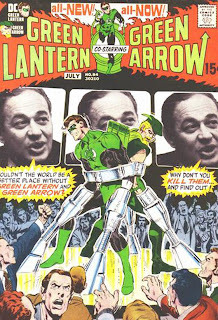 And I didn't quite buy Speedy's addiction as being Greem Arrow's fault. 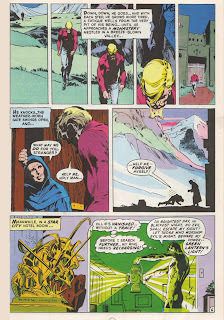 The very last issue #89, the one that was a Christ retelling, was quite odd, but I found it quite powerful. I thought it was a fitting end for the series.